Now in it’s third iteration, the New Balance Leadville has reached it’s finest form to date. There wasn’t anything glaringly wrong with the first two versions for me, but the fit just never felt quite right. The tongue was too short on v1, and I experienced a slipping heel in both v1 and v2. Version 3 has been refined to make up for the shortcomings of v1 and v2, and in my opinion, might be the best lightwieght hiking shoe available for 2016. I wear a 12.5 in almost all of my hiking shoes, but wear a size 12 in the NB Leadville v3. This is the same size I wore in v1 and v2, so stick to your current size if you own a previous version of the Leadville. This new version of the Leadville fits much like the previous version from the midfoot through the forefoot, and this is a very good thing. The toebox is nice and wide without being sloppy, and the midfoot provides precision with laminated overlays, while still allowing your foot to swell on longer days. The biggest improvement for me on the fit comes in the heel. As I mentioned above, my heel slipped a little with every step in the first two versions of this shoe. I think this was partially due to having a stiff midsole without a lot of flex. The width and lack of precision in the heel construction was also at fault. This issue is completely gone in this new version. My heel feels secure, and the slipping is gone. New Balance uses the sock like PhantomFit will feels seamless and hotspot free. 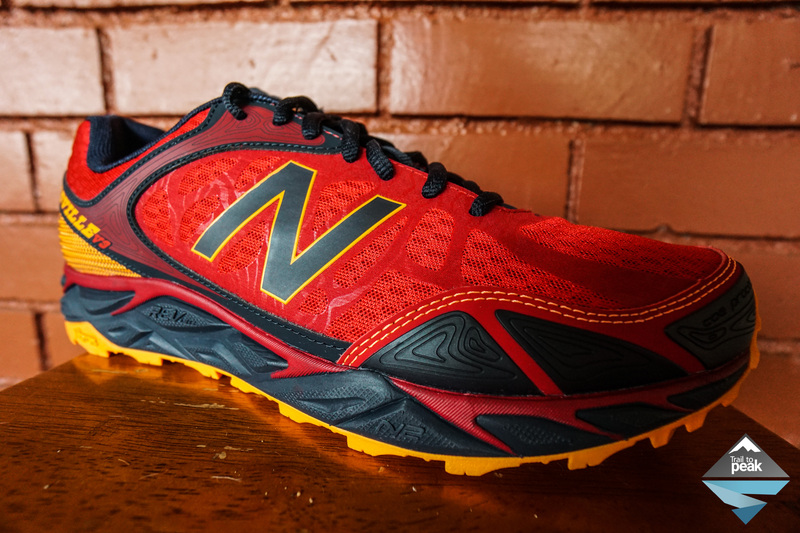 New Balance has created a really nice upper for the v3 of the Leadville. You can definitely tell that these shoes are made for running ultra distance races, and that is why they work so well of long distance hiking. The Leadville upper is constructed from a very breathable mesh, without being too porous. Security and stability are provided by laminated overlays that provide just enough of a wrap without being constricting. Toe protection is provided by a toe bumper and rand that is stylized with topographic lines like a map. Stability in the heel is provided by a structured heel counter and a stitched overlay that wraps from the heel to the top lace eyelets. From heel to toe, the v3 feels dialed in. The tongue on the v3 is gusseted to keep out debris, and unlike v1, has plenty of length to keep the top laces from digging in to the top of your foot. New Balance uses a nice thick lace on this shoe which allows for complete security without over tightening. The final thing about the upper is the ample toe box. It’s great to see so many shoe manufacturers waking up to the reality that runners and hikers aren’t a fan of foot binding. The Leadville v3 gives plenty of space up front, and I have no doubt it will handle swollen feet very well after 30+ miles on trail. The midsole on the New Balance Leadville v3 is built on an 8mm platform and is composed of REVLite, New Balance’s proprietary lightwieght cushioning compound and N2. The previous version of the Leadville used New Balance’s N2 cushioning, so it will be interesting to see how this midsole update affects the overall ride with the two combined. I can already tell it feels better after an initial use. As I mentioned earlier, the previous midsole felt a bit stiff, the new combination seems to have fixed that issue. The markings on the midsole seem to indicate that REVLite is used in the heel and midfoot, and N2 is used in the forefoot. The Leadville v3 retains the forefoot rockplate protection used in previous version, and can be seen through cutouts on the midsole. This shoe is listed as mild stability, as it employs a small dense post on the inside of the heel. This slows the rate of overpronation without getting in the way. This post also is great for providing stability with a heavier pack. New Balance is using a newly designed Vibram outsole for the Leadville v3. This outsole uses multi-directional rectangular lugs around the edges and triangular lugs down the center. This full coverage outsole looks to provide exceptional protection and grip. The two previous version of the Leadville had outsoles that proved to be very durable. I hope this new version is the same. This new version of the New Balance Leadville has me very excited. A newly designed upper, midsole, and outsole seem very promising, continuing with the heritage of v1 and v2, while improving on their shortcomings. I will definitely check these out. I really need a wide toe box and this looks very positive. Thanks for the review. I’m the same way. I can’t live without a wide toebox! Hopefully you’ll be able to find it! I just bought these!!! They look like the do anything and go anywhere trail runner I have been looking for. I hope they make my dreams come true. Nice review! Thanks, Grant! New Balance really designed this new v3 very well. I hope you enjoy them! Great review! I love the Leadville.